6. With the aid of a diagram describe the structure of the choroid. The choroid is the posteriormost portion of the uvea and is a highly vascularized and pigmented tissue embedded between the retinal pigment epithelium and the sclera. The thickness of the choroid is greatest at the posterior pole, where it is about 0.2 mm thick. In the periphery, the choroid tapers to a thickness of about 0.1 mm. The choroid adheres only loosely to the sclera over most of its area, and as a consequence, the choroid is easily separated from the sclera by either hemorrhage or serous fluid. The only points at which the choroid is fixed are the optic nerve and at the vortex veins. Attachment of the choroid to the sclera at the vortex veins explains the classic quadrantic appearance of choroidal detachments. The choroid receives its blood supply primarily from the posterior ciliary branches of the ophthalmic artery. There is also some supply from the recurrent anterior ciliary arteries. Four or five vortex veins provide the choroid's venous drainage. The nerve supply of the choroid is derived from the long and short ciliary nerves. The long ciliary nerves are branches of the nasociliary nerve, which originates from the first division of the trigeminal nerve. The long ciliary nerves carry sensory and sympathetic fibers. The short ciliary nerves arise from the ciliary ganglion of the oculomotor nerve and carry both sympathetic and parasympathetic fibers. The choroid is a multilaminated structure that can be divided into four layers: Haller's layer, Sattler's layer, choriocapillaris, and Bruch's membrane. Haller's layer consists of the large-diameter vessels of the choroid and represents the outermost layer of the choroid. Interspersed with the blood vessels are melanocytes, nevus cells, and nerves. These blood vessels possess an outer adventitial layer, an intermediate smooth muscle layer, and an internal elastic lamina. They are not fenestrated and as a result do not leak dye during fluorescein angiography. Sattler's layer is deep to Haller's layer and is composed of medium-sized blood vessels, melanocytes, fibroblasts, lymphocytes, mast cells, and supporting collagen fibers. Within Sattler's layer, arteries gradually decrease in caliber and form arterioles. In the process, the arteries lose their muscularis layer and their internal elastic laminae. Like the vessels of Haller's layer, the vessels of Sattler's layer are not fenestrated and do not leak fluorescein. 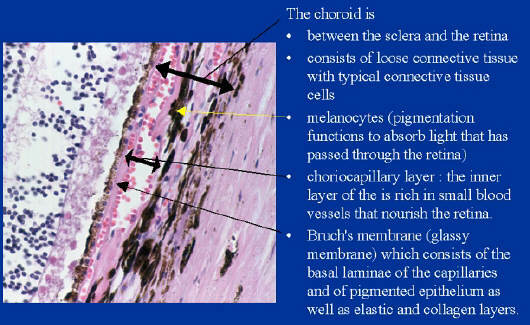 The choriocapillaris is a layer of capillaries that is immediately adjacent to Bruch's membrane. The diameter of the capillaries is relatively large and measures between 25 and 50 µm.4 These capillaries are fenestrated and therefore are permeable to large molecules, including fluorescein. On fluorescein angiography, the diffuse fluorescence of the choroid is primarily due to the leakage of fluorescein from the choriocapillaris. The choriocapillaris extends from the edge of the optic disc to the ora serrata.